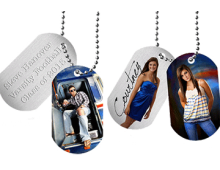 Tags made in the USA - can be engraved with any combination of Photographs, Logos, Line Art/Graphics and/or Text as permitted by the size and shape of the tag. Both Anodized Aluminum and Full Color Aluminum Tags with subsurface imprinting. We now do QR Codes that can be scanned with any iPhone or Android device. The QR Codes can also be used for personal emergency identification and notification. A few uses are: ID Tags, QR Code Tags, Pet Tags, Medical Alert Tags, Sports Tags, Event/Party Tags. 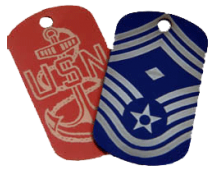 Anodized Aluminum Tags can be engraved with any combination of Photographs, Logos, Line Art/Graphics..
Full Color Tags can be subsurface imprinted with any combination of Photographs, Logos, Line Art/Gra..
Anodized Aluminum Alert Tags can be engraved with any combination of Photographs, Logos, Line Art/Gr..
Full Color Round Aluminum Tags can be subsurface imprinted with any combination of Photographs, Logo..